Guwahati: Even as Bohag is on its arrival, the romantic man is no more to invite his beloved ‘Bohagote Aahibi Senai Oi’ during the spring. Charu Gohain, the man who created a weave of Romanticism with his songs and lyrics breathed his last at around 10.45 am at the Gauhati Medical College and Hospital (GMCH) at the age of 61 on Saturday (March 7, 2012) leaving thousands of his fans shattered. He was suffering from liver infection for a long time. GMCH superintendent Ramen Talukdar told Seven Sisters Post that the singer was admitted on February 24. “On April 5 he was shifted to ICU as his health deteriorated,” he said. Charu Gohain who was known for his simplicity and romantic lyrics shot to limelight with his ‘Kone Bahi Bai Rati Muk Kondowai’ in the early 1970s which was composed by J P Das. After he stepped in the musical world as an All India Radio (AIR) artist in 1972, he wrote and sang songs which increased his admirers from different walks of life. He was so passionate about music that during his initial stages when he was at Charaideo in Sivasagar district he used to travel around 20 kilometres on his bicycle to learn the craft of six strings. “He was passionate about music. He would do anything for the sake of music. To fill the void he left would be really tough. He was more than a friend to me,” said J P Das, one of his close friends. Gohain who was born at Charaideo on September 17 in 1951 has performed at various stages at New Delhi, Mumbai and in Bengal across the country. He also worked with singers like Udit Narayan, Bappi Lahari and Jolly Mukherjee. 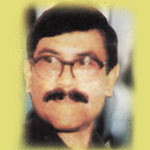 In the film ‘Bokor Majot Jole’, Udit Narayan sang ‘Xholla bosoria tumar deha’ which was written and composed by Gohain. Later he wrote around six songs for Bappi Lahari which were sang by Lahari, Gohai and Jolly Mukherjee. “He was also working on an album with his son in law Pulok Nath before his health deteriorated,” Das said. Altogether Gohain has sang around 200 songs. ‘Natun Niyor’ which was released in 1988 was his first album. Besides, ‘Surabhi’, ‘Jon Jole Kopalat’ and ‘Charu Gohainair Geet’ (Volume I and II) were his other albums. He was also a good guitarist besides being a composer and lyricist. “He was always publicity shy and did his job silently. May be that’s why he was not regarded for any awards,” J P Das said. He left behind wife Sewali Gohain, daughters Kakoli and Surabhi Gohain. Meanwhile, his demise has left the people in a state of sorrow. Assam chief minister Tarun Gogoi in a message said that Gohain could win the hearts of the people and his untimely death has left a huge void. Several organizations including All Assam Students’ Union (AASU), Sadou Asam Karmachari Parishad, United People’s Front etc have condoled the death of Gohain. “His contribution to enrich the cultural heritage of the state is commanding. May his soul rest in peace,” said AASU general secretary Tapan Kumar Gogoi. Popular singer Dwipen Barua said that besides being a good singer Gohain was also known for his skills with the strings. That was inspiring about my blog. Please find your blog @ my recommended listings.